Lee Ann Weinberg, MBA, MSHA started at Green Hill in May of 2015 and is the third Executive Director in Green Hill’s history. Lee Ann has a background in health care operations and strategic planning, spending nearly six years as the founding Administrator of Metro Specialty Surgery Center, a multi-specialty outpatient surgical hospital. Since 2015, Green Hill has experienced marked growth in its patient services, land, and capital changes including the construction of new offices and the planned expansion of its clinic during the Winter of 2018 so that Green Hill may more effectively meet the demand for its programs. Green Hill is also looking to expand its services to an outdoor sensory arena on its property. Courtney Springer joined Green Hill Therapy’s staff in May of 2017. Her previous experience comes from both the non-profit and medical fields. Courtney came to Green Hill from Centerstone of Kentucky, where she was responsible for the authorizations and billing of Green Hill’s EPSDT clients for more than 3 years. Courtney’s prior pediatric medical management experience and familiarity with Green Hill made joining the team a very easy decision. At Green Hill, Courtney manages the Front Office, which includes new patient intakes and scheduling, EPSDT billing, payroll and other HR duties. Courtney has a teenage son, Jackson, who volunteered with Green Hill this summer. She is thankful to return to a position that allows her to interact with Green Hill’s kids and families. Learning about and working with horses has always been a “one of these days” for her and is thrilled to be able to do so. Being Green Hill’s Office Manager is a dream come true. In her spare time, Courtney loves to cook, bake, crochet, cross stitch and listen to audio books. Tim Shull, JD Louisville 1990, spent most of his high school years as an unpaid intern at the hunter-jumper barn in his Kingsport, TN neighborhood. He showed jumpers at small horse shows all over east Tennessee and southwest Virginia. While at Transylvania in Lexington, KY, he rode steeplechase races. Between college and law school at the University of Louisville, Tim worked in the race horse industry exercising horses and other jobs. 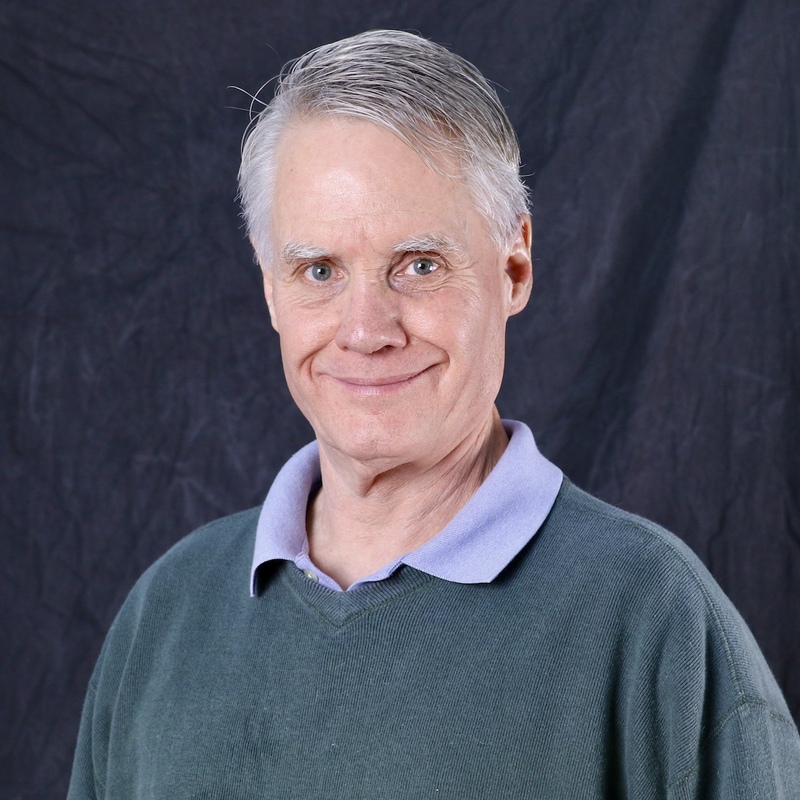 He broke lots of yearlings in Lexington, and he exercised horses at race tracks in Los Angeles, Chicago, New Orleans, Detroit, Arkansas, and Miami, as well as KY.
After law school, Tim represented kids as a public defender for most of his legal career. He retired from the Kentucky Dept. of Public Advocacy. Tim’s wife, Mary Jo White, is the Director of Medical Student Affairs at the University Of Louisville School Of Medicine. Mary Jo and Tim’s daughter, Sarah Alice Shull, is an actor and lives in New York City. Brittany Browning, OTR/L joined the Green Hill team in 2015 after earning her Masters of Science in Occupational Therapy from Spalding University in 2014. The uniqueness of Green Hill allows her to not only offer skilled occupational therapy services in a typical clinical setting, but also the chance to utilize equine movement and hippotherapy principles as well as the Home of the Innocents therapeutic pool to provide aquatic therapy. 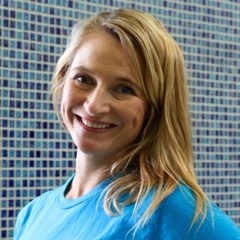 She has completed Level 1 and Level 2 training through the American Hippotherapy Association and has also completed a pediatric aquatics course through Aquatics University. 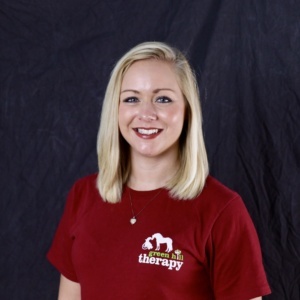 Whether it’s in the clinic, the barn, or the pool, Brittany enjoys utilizing client-centered treatment principles to help children of all ages and diagnoses reach their full potential. She enjoys collaborating with the children, parents, therapists, office and equine staff that make up our Green Hill family to impact our community in a positive way. In addition to pediatric experience, Brittany has also had the pleasure of working with adults in long and short term rehab facilities. When she is not at work, she enjoys spending time with her husband, Craig, family, and friends. She also enjoys spending time with her English bulldog, Lulu. Christine Bumann, COTA/L graduated from Brown Mackie College with an Associate Degree in Applied Science of Occupational Therapy in 2011 and has been a dedicated Green Hill Therapy clinician ever since. While working as a childcare provider as she pursued her degree, Christine garnered pediatric experience and realized her love for helping children. Upon the birth of her nephew with a developmental delay, she knew she had a special interest for helping children of all ability levels. 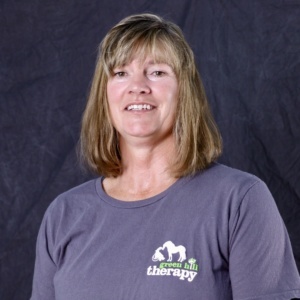 Christine has developed an array of specialized therapy skills and equine knowledge while providing services at Green Hill. She incorporates the training from her American Hippotherapy Association (AHA) Level 1 and Level 2 courses along with her understanding of sensory integration techniques into her therapy sessions on a daily basis. She utilizes her AHA training to assess and choose potential therapy horses for our program and works to perfectly match each patient with “just the right” horse. When she is not treating patients and working directly with the Equine Manager, you can find Christine helping to improve services at Green Hill by developing new processes and orienting new clinicians. In her spare time, Christine and her husband Adam enjoy attending Louisville sports events and exploring different restaurants around town. 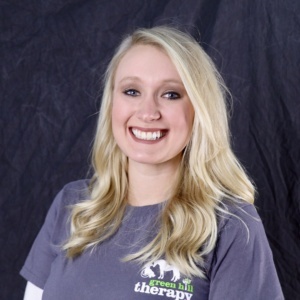 Sarah Halfacre, MSOT, OTR/L, ATRIC, joined Green Hill Therapy’s staff in February of 2017 and has since completed her American Hippotherapy Level 1 training with plans to complete level two training this fall. She provides hippotherapy at Green Hill and aquatherapy at the Home of the Innocents. 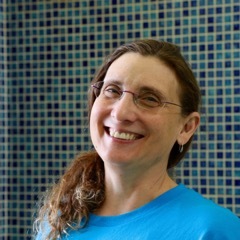 In September of 2017, Sarah received her certification for aquatherapy from the Aquatic Therapy and Rehab Institute. Sarah has experience in both adult and pediatric populations with concentrations in mental health and physical rehabilitation settings. 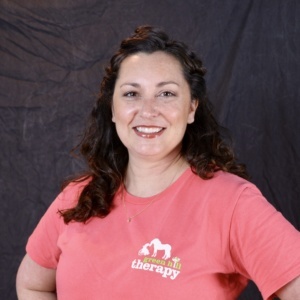 She provides educational presentations to a variety of audiences in order to increase awareness and understanding of therapy techniques to benefit differently-abled individuals. At Green Hill, Sarah uses a holistic approach, utilizing creative play activities, making use of the outdoor spaces at Green Hill to engage children in softball, landscape design, and even painting rocks to achieve functional outcomes and reach therapy goals. Sarah has had the pleasure to see dozens of athletes achieve many accomplishments during her 18 years of coaching Special Olympics sports. Sarah has two adorable children and loves sports and living an active lifestyle. Jane Harper, OTR/L, B.A., M.A, B.S. 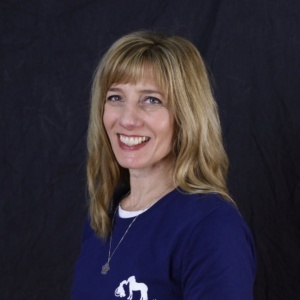 has over thirty years experience as an occupational therapist with over twenty-five years specializing in pediatrics. 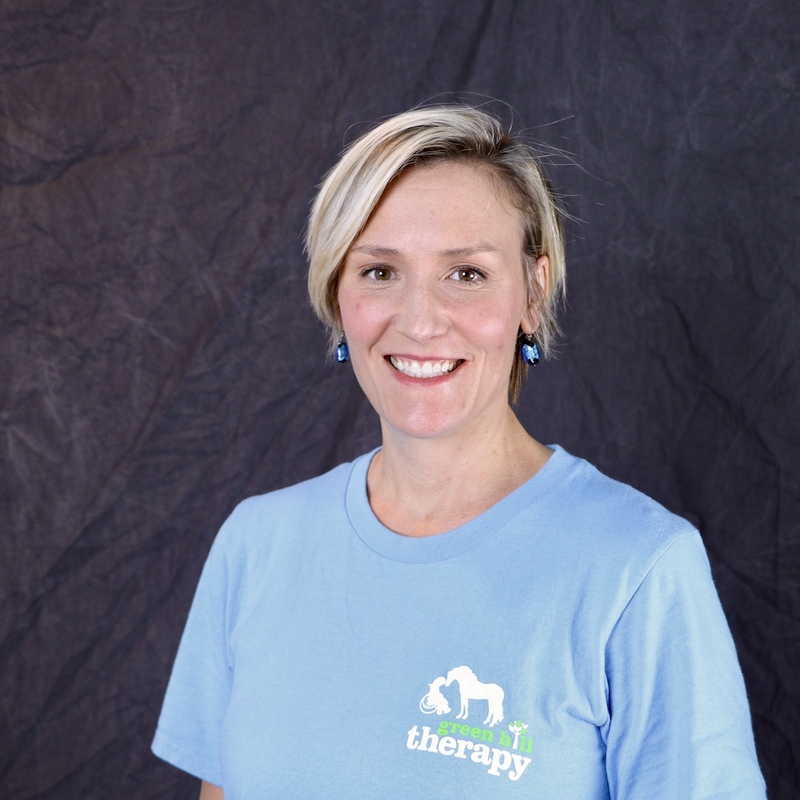 She joined Green Hill Therapy in 2007 after ten years in the First Steps program. 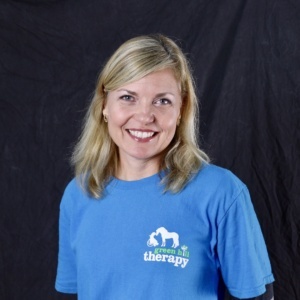 She has certification in Level 1 Hippotherapy and Pediatric Certification from the Aquatic Therapy and Rehabilitation Institute. 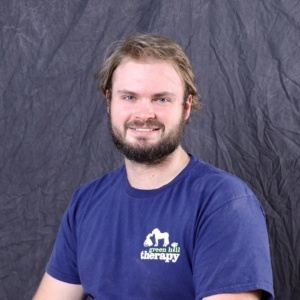 Professional continuing education includes Therapeutic Listening, pediatric kinesiotaping, reflex integration to improve sensory processing, pediatric neuro-development treatment, and the use of assistive technology. Jane uses her creativity to make challenging activities fun and engaging, making Green Hill’s proven playful approach a perfect employment fit! Jane shares her home with her husband and 10 cats. She is a long-time volunteer with Alley Cat Advocates and provides in-home medical rehabilitation to injured and sick felines (that’s how she got 10). Sara Johnson, OTR/L graduated from Spalding University in 2008 with a Masters of Science in Occupational Therapy. Sara completed her Level II fieldwork rotation at Green Hill. She started working at Green Hill Therapy after graduating. She has completed American Hippotherapy Association Level 1 and Level 2 training. Other continuing education has focused on ‘Autism Meltdowns in Children and Adolescents’, and ‘Social Skills for Children with Autism Spectrum Disorder’. Sara is CPR and First Aid certified for adults and children. Sara loves working with her kids at Green Hill and watching them grow and become more independent every day. Her treatment style is a client-centered approach, and often incorporates parents and caregivers in the session. Sara believes this approach empowers and motivates the client in the therapeutic process and provides for the best carryover at home. In her free time, Sara enjoys baking, reading and spending time with her husband, David, and daughters, Madalyn and Olivia. Julie Minnick, COTA/L, joined Green Hill Therapy’s staff July of 2017. 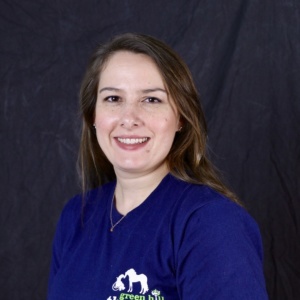 She joins the team with an extensive background in Equine Management and programming, non-profit administration, and is a Certified Occupational Therapy Assistant. Julie’s experience in a developing and implementing comprehensive equine programming for children and adults of all ages along with her therapy background enables her to creatively support the therapeutic needs of our our children here at Green HIll through hippotherapy. Her knowledge and passion for the horse and her skill in developing a strong equine partnership with each of our horses ensures a safe, individualized session. Karla Powrie, PT graduated from The Ohio State University with a BS in Physical Therapy in 1994. Since then, Karla has had experience in an acute care hospital, orthopedics and sub-acute rehabilitation. She has worked at Green Hill since June 2014, is enjoying the experience in pediatrics and is looking forward to completing her Level 2 certification in hippotherapy this year.